Please refer to our stock # NJ-2 when inquiring. Kasuri Kimono. Kumejima, Okinawa Prefecture; ca. 1960. 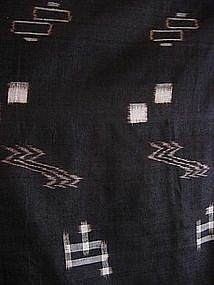 "Kumejima kasuri dorozome ni gyoku kasuri" (ikat, mud-dyed, 2 pattern per panel, kasuri kimono from Kumejima [an island of Okinawa Prefecture.]) L.60 x W.48” Kumejima tsumugi (Kumejima Silk Pongee) The stylized patterns depicted are described by the following Okinawan words: (squares) taachi busaa, (rectangles) mimichikitou “pig trough”, (lattice/check) kujiri koushi, (zig zag) miji fuu “water clouds”. The color of this kimono is a dark brown referred to in Kumejima as “koge cha” (burnt tea), and is produced by an initial dyeing with “guru” (sarutori ibara , Sumilax China) and “techika” (sharinbai, Raphilolepis Umbellata), then mud mordanting. Thought to be the oldest form of tsumugi in Japan, Kumejima tsumugi production originated in the mid-15th century, and in September of 2002 was given the designation of Jyu-yo Bunka Zai (National Important Cultural Treasure) by the Japanese government. Production of the fabric and the dyeing of finished cloth is a long, complicated, and expensive process still carried on today by a few women on Kumejima Island. A custom-ordered finished kimono in today’s market carries a price tag of approximately $10,000 to $20,000 US dollars, and requires a lengthy waiting period.